The owner invited me to provide a quote to re paint the inside of the brewery situated on the outskirts of Stratford upon Avon. It isn't clear what paint was used when it was first built but it has not lasted well. It was probably a contract mat which has no durability at all. 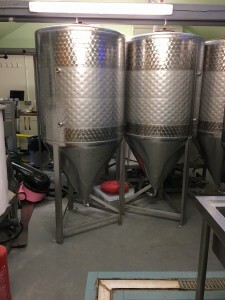 Also the brewing process produces heat and this causes condensation on the ceiling and walls. Before preparation showing signs of original degraded paint. 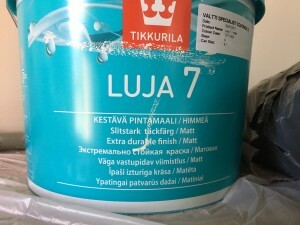 I specified a high quality paint called Luja, manufactured by Tikkurika in Finland. It is perfectly suited to areas of high traffic and humidity. It's also easy to clean so will help to extend the maintenance period for the business. Other environments where this product would be used are swimming pool areas, changing rooms and even stations on the London Underground. Let's just say it's very durable ! It's also available in most colours. Including Tikkurika's own extensive range. 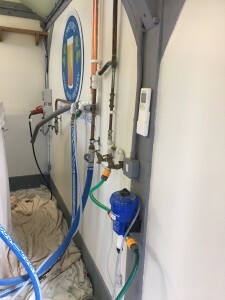 There is as you would expect a lot of equipment in the 2 rooms used to make the beer so to simplify the painting process I moved the majority of equipment to one room and focussed my time on one empty room at a time. 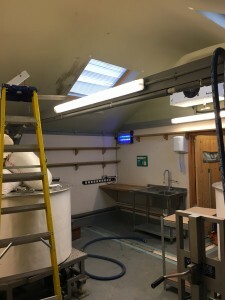 Tanks moved to main room after re painting to allow space for the tank room to be painted. There were a few fixtures to remove. I used my Makita cordless 10.8v drill for this. It's a good quality lightweight tool and saves time compared to a regular screwdriver. The first and probably one of the most important steps is cleaning. All the surfaces to be painted have to be thoroughly cleaned with an appropriate product and then rinsed. This is standard practice in commercial environments. There were two main reasons for this. 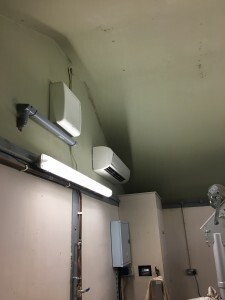 Firstly some areas had started to show signs of mould like you may find in a shower cubicle. For this I used a good quality mould and mildew cleaner. It also contains bleach which kills any residual spores. This was mainly on the ceiling and in a few corners. 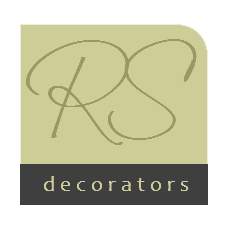 These products are available from decorators merchants and also in the cleaning aisle of most supermarkets, in a trigger spray bottle. I used a damp microfibre cloth to wipe over the surfaces after applying the product and rinsed with clean water. 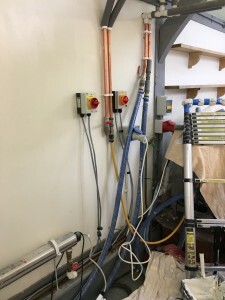 Although the walls appeared clean it was still important to make sure the surfaces were free from contamination which may have been caused by products used in the brewing process. I chose to use Virosol diluted to about 50 parts water 1 part Virosol. The product, manufactured by Clover Chemicals is probably the best all round cleaner and degreaser I have used. 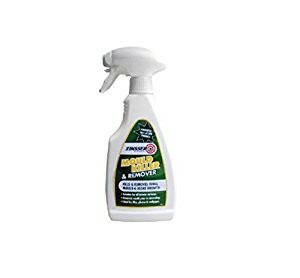 It's very versatile and can be used in many situations, from cleaning down walls to removing hardened paint from brushes. 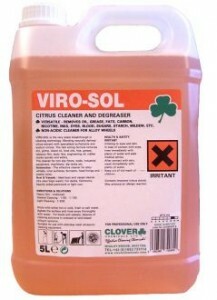 The diluted Virosol was applied using an atomiser and completed using the same process as mentioned above. There were a few holes to fill so I chose a good all round filler, Toupret TX110. Resin based powder filler which is tougher than most but sands well with my Mirka sander, which has dust extraction. A few corners had cracks so I filled these with Graft IPT sealant. It's more flexible than all the other caulks I have tested so it was an obvious choice. 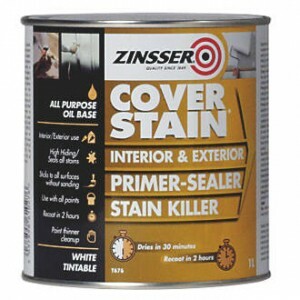 Some of the painted areas had stains so to be sure these would not come through the new paints I used Zinnser Coverstain. This is an oil based product which is quick drying and especially suited to these types of stains. I used a mixture of polythene and heavy cotton dust sheets to protect the flooring and equipment. Where necessary some items were masked off using 3M blue tape. A good quality product which can be removed without leaving any adhesive residue. My plan was to make sure I get the first of the two rooms finished on the second day. 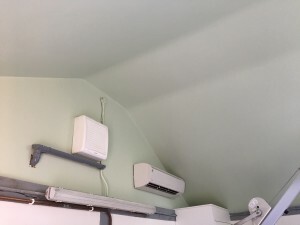 I applied two coats of the Luja in the specified green colour to the ceiling. 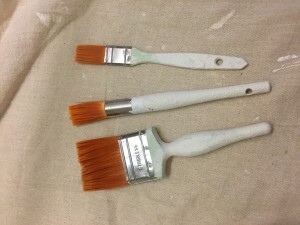 Using a 2.5 inch Fox brush. These are available from my paint brush. They are good quality and hold a lot of paint. My selection of Fox brushes for this job. After brushing the edges I always roll over the area I have brushed with a small roller. In this case I used a 4 inch which is in my pelican kettle. It's ideal as it holds the small roller and a brush on a magnet. Once all the edges were painted I rolled the main ceiling with a 12 inch roller. I would usually use a larger roller, but as the ceiling was over 10 feet high and access over equipment quite awkward I opted for a 12 inch which is a bit lighter in the end of a long pole. I used standard roller sleeves from Trade 1st. They are good quality and well priced and can be thrown away at the end of the job. The walls were painted in much the same way. However there were a lot of fittings and pipes to paint round, which couldn't be removed. To make life easier I used a few different Fox brushes for getting into tight spaces. I also used a couple of small rollers as there were not many areas where a large roller was practical. Except in the room where the tanks sit, which has larger expanses of wall. Areas with lots of pipework etc needed to be painted around. Fiddly and time consuming! Thankfully the Brewery was able to close for a week while the work was taking place. This meant the tanks could be emptied and although heavy they could be moved without too much effort. Probably time for a beer now !